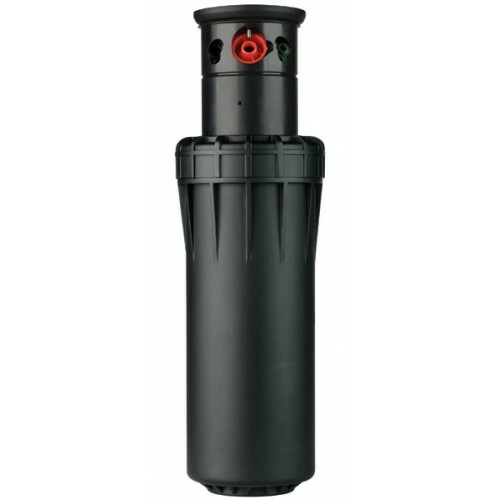 The I-90 Rotary Sprinkler is the industry’s longest distance rotary sprinkler specifically designed for parks, sports fields, and public areas. With a radius up to 30 metres from a single sprinkler, the I-90 boasts a coverage area no other commercial sprinkler can deliver. Yet, its reduced-size diameter and cushioned rubber cover make it the perfect choice for parks and wide-open lawn areas, as well as perimeter watering of athletic fields and horse arenas. The rotor is also perfectly easy to service, with a “jar-top” body cap that allows quick access to the filter screen and check valve with no extra pieces, parts, or tools required. The I-90 is offered in two models–a full-circle opposing-nozzle version or an adjustable arc model–each with color-coded nozzles that can be field-changed to match the specific needs of your site.